UPDATE: Gov. Cuomo calls for a "full investigation into the collision"
Two Long Island Rail Road trains coming from opposite directions hit a vehicle at a crossing as the driver tried to get around the gates, killing three people inside the vehicle and derailing at least one of the trains, officials said. A driver was apparently trying to get around the gates at the School Street crossing in Westbury Tuesday evening when the vehicle collided with an eastbound train that was just pulling out of the station; it was then slammed by a westbound train, MTA officials said at a news briefing. The impact killed the three people inside the vehicle. Seven train passengers were taken to the hospital to be checked out, along with an engineer who was "very shaken up" and a conductor, according to MTA President Phillip Eng. There were about 100 passengers on the eastbound train, and about 800 passengers on the train heading into Manhattan, officials said. Chopper 4 over the scene showed the front of the train off the tracks and crushed into the platform. 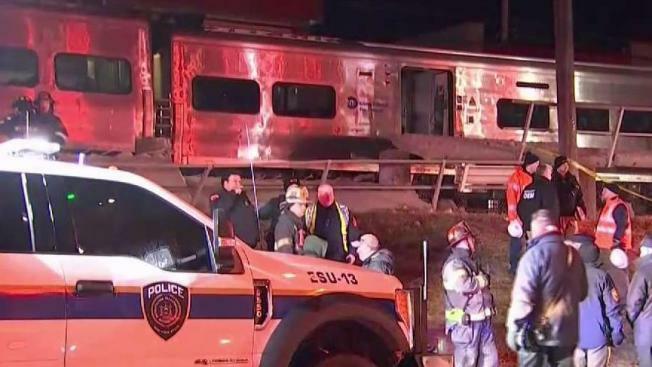 The concrete platform appeared to have buckled under the impact of the crash; officials said the third rail was also damaged. Police said a fire broke out upon impact, prompting an evacuation of the westbound train as firefighters worked to knock out the blaze. Passengers on several LIRR trains reported being held inside their trains as a result of the emergency response. A shuttle was eventually put in place between Hicksville and Babylon, which was expected to last into the night. Service was suspended in both directions on the Ronkonkoma and Huntington/Port Jefferson branches as fire departments responded to the accident. Customers are also advised to use alternate branches, including Babylon, Montauk and Hempstead. Scroll down for real-time transit updates. Service changes are expected to last into the morning commute Wednesday. Most of the damage appears to have occurred on the westbound side, but officials will continue to assess the damage through the night. "Until we can remove the train and get further in there, it's not clear how long the repairs will take," Eng said. Officials initially said the vehicle hit by the train was a truck, but then said at the news briefing it's not clear what type of vehicle it was. Eng said the MTA works closely with local police when it comes to grade crossing safety and to educate the public about the dangers of trying to beat the gate. "You really not only take your own life into your hands, but you're taking others' lives into your hands -- our engineers, our conductors, our customers and anyone else along the local roads," he said. Records from the Federal Railroad Administration show there have been four crashes at the School Street crossing in Westbury, most recently in 2009, all involving passenger trains. There were no injuries in the October 2009 and May 1981 crashes there. But there was one fatality each in the February 1995 and May 1984 crashes, records show.